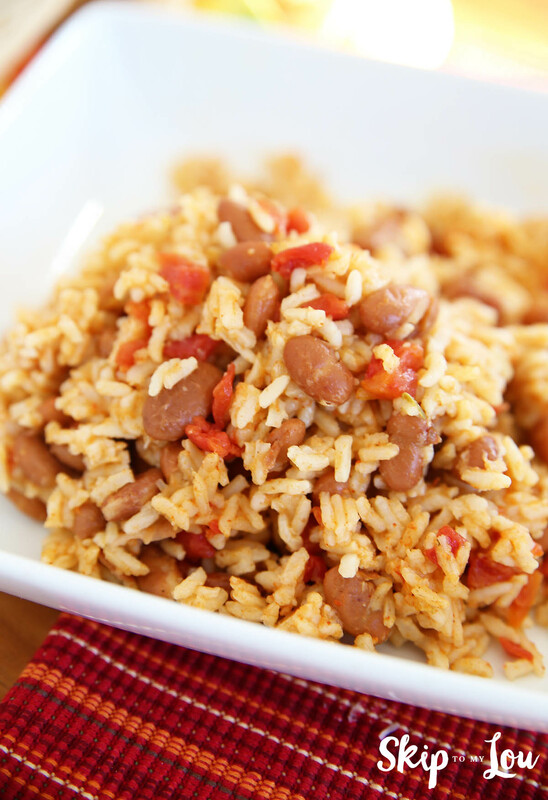 This delicious pressure cooker Mexican Rice & Beans is the perfect side dish for tacos, nachos and enchiladas. I have decided the pressure cooker is my new very favorite thing. How did I not know about this amazing appliance? I have spent years being afraid of blowing up my kitchen and ignored how very useful this appliance could be. In fact, I have decided it is the perfect tool for the non planner. I love crock pot cooking but that takes planning and remembering. I can cook most anything in under an hour with ingredients I have on hand. I will say that every meal we have had since Christmas as been with my new pressure cooker. After reading tons of reviews I chose the Instapot but many are just as happy with the Cuisinart. The main difference, and my deciding factor, is that the Instapot has a stainless steel pot instead of a non-stick. The Instapot does cook at slightly lower pressure, but it hasn’t caused any problems. Turn pressure cooker to saute. Heat oil and add in onions and jalapeno. Cook until just softened. Stir in garlic, chili powder, cumin. Cook for about 30 seconds. Stir in rice. Pour in tomatoes and chicken broth and salt. Lock the pressure cooker lid in place and choose high pressure, setting timer for 8 minutes. When timer goes off, use quick release. Carefully remove lid. Stir in beans and cilantro. For this picture I did forget the cilantro, but if you like cilantro it does make this dish extra nice! 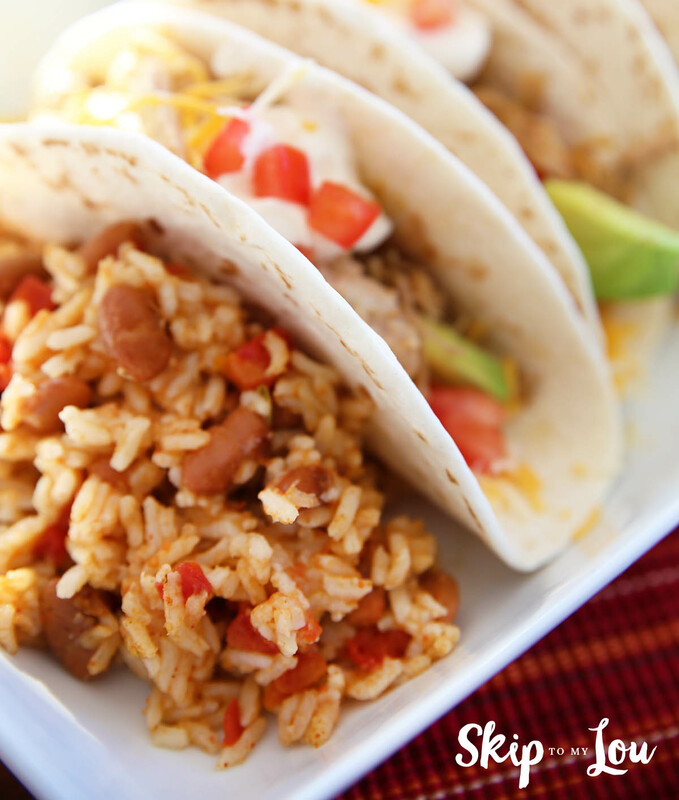 You are going to love this pressure cooker rice! It saves you time and is so delicious! If you are looking for more great side dishes we love stick of butter rice and these herb oven roasted potatoes. If you want to add some fruit to the table this apple salad it also very good. I made this last night. Not only was it DELICIOUS, but also easy and quick to make. Thank you for the concise directions and wonderful recipe. I made this as a side dish but it easily could be a main course. One guest had three servings. Ahhh thanks so much Judi for your sweet comment! I am so glad you liked it. New to the electric pressure cooker world and this is my first non-roast dinner with it. Can't wait!! I have an older pressure cooker - no cook settings or timer (it was my grandmother's). Would I need to cook longer than the 8 minutes? I'm new to pressure cooking... The beans don't actually get cooked. Will they heat thru by just stirring them into the hot rice? Hi Rachel, The beans should have been previously cooked in the pressure cooker or you can use a can of beans. They will be soft and when you stir them in and the hot rice will warm them. Could you do this on the stove without a pressure cooker? Yes, I would think you could cook on the stove. I would look at the rice package and see how long they recommend cooking for a guide. Looks yummy! What if I don't have a pressure cooker? Could I throw it in a crock pot??? It is worth a try Kristie. You might see if you can find a crockpot rice recipe to see how long rice is cooked. Just make sure you have enough liquid. This could easily become a staple in our house.